You graduated from university five years ago with good grades. You have yet to find a job. It’s not your fault. I have been there. But then you heard about your former classmate who has a nice-paying job and other money-making side-hustles. How did he do it? Why does he have multiple sources of income and you have none? In this post, I will give you ideas on how to leverage the opportunities you already have, opportunities you previously neglected, to get you going. And here is where it gets good, once you get busy, people trust you more and give you even more responsibilities–you establish multiple streams of income. I started writing this post about a month ago when a former classmate told me how well another former classmate of ours, Ike*, was doing. 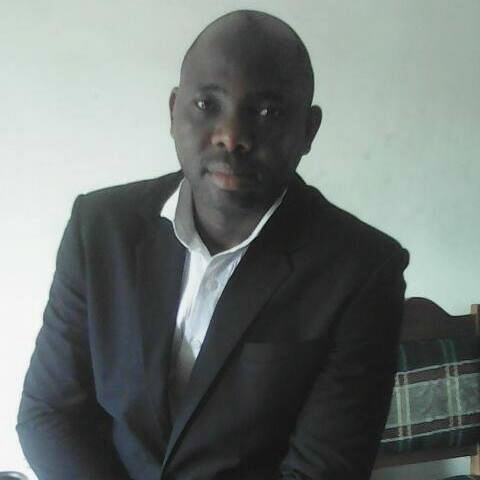 A young attorney, Ike has a successful law practice in Abuja. Besides his day job, Ike is also a Special Adviser to a State Government in Nigeria. When he gets home from his law practice where he wears a suit and a tie, Ike puts on casual clothes to visit work sites where he acts as a supervisor. For this third job as a supervisor, Ike is contracted by busy businessmen who have ongoing building construction projects but cannot make out time to monitor day-to-day progress at the sites. Ike uses his training as an attorney to ensure that workers comply with the building plan, resources are not wasted, and deadlines are met. The same weekend I heard about Ike’s success, I ran into Silvia and was even more inspired by how well she manages her time juggling multiple jobs. Silvia* has a demanding job as a top manager in a private firm. Silvia also has a real estate investment that requires as much attention as a full-time job such that some investors with a portfolio as big as hers employ resident managers for the sole purpose of managing the properties. In addition, Silvia teaches three classes in a State university. Silvia is also currently studying for her Ph.D program. Lastly Silva is the primary care-giver to her two kids. Though she no longer does, just a few years ago, Silvia also had another teaching job for her Saturdays. While having multiple jobs may make a work-life balance harder to achieve, it has its upsides. When you diversify your sources of income, you can do many things you cannot otherwise do with limited resources. You can upgrade from shopping at Ross to Nordstrom. You will have sufficient fund for medical bills and legal bills. (As unfair as it sounds, health can be bought, and justice can be bought; ask Lamar Odom and O.J. Simpson.) Further, when you have enough money, you can send your kids to best private schools around and set them up for a great start in life. Most important, when you become rich, you are able to touch several lives. (Even if he had good intentions, the good Samaritan will not be known today if couldn’t take that wounded traveler to the hospital because of lack of money.) Bill Gates and Mark Zuckerberg are able to fight and eradicate diseases around the world because of the enormous amount of resources at their disposal. You don’t have a job so that sounds like a good reason to stay at home all day binge eating and netflixing. The key to getting started is to get busy, occupy your time with something productive, however small. For example, I find that volunteering has a way of opening hitherto closed doors. If you are looking for a teaching opportunity, walk to that primary school close to your house and tell the principal that you want to volunteer in his school. It’s more likely than not that he will find something to keep you busy. When you volunteer with an organization, you have a higher chance of getting employed when a paid opportunity opens up than outsiders who are not familiar with the organization’s culture. I once volunteered with an organization and months later, when they were hiring, they first contacted those of us who volunteered with them to see if we were interested in the position before offering it to outsiders. Also I read a story by a Nigerian girl of how, when she was unemployed, she started volunteering with two hospitals in Lagos as she was in the medical field. With time, one of the hospitals was hiring and offered her a full time job. She said that while she may have “wasted” transport fares in those early days as a volunteer, commuting to both jobs, what she makes now more than compensate for the “lost” time and money. Had she been at home sitting on the couch, she said, she will still be unemployed. In a post by this title, Toby Nwazor writes about how though he had always loved writing, he studied engineering at the university because of the misconception that intelligent people study sciences. After graduating, he got jobs in his field but was never quite successful. A question by his pastor asking him what he had in his hand, a natural talent, an allusion to Moses’ encounter at the burning bush, prompted him to go back to writing. He is now a freelance writer, happy and fulfilled. Before now, he didn’t believe he could make money writing. Sometimes, tapping into your natural talent can take you to places where you can never dream of going with your 9-5 job. Find out what you already have in your hands. If you are unemployed, you are in a good position to find out where your talent lies. Because of the free time on your hands, you can try out your passions, interests, etc and see where they lead you. If you are an artist, draw a popular musician and tag him on social media. They take notice and share it on their wall, and bingo, you are getting calls from prospective clients. If you love writing, you can sign up an account with Wikipedia and pitch to Nigeria celebrities and businesses, who are notable but are not on Wikipedia. Offer to create a page for them. If you have an aunt or uncle whose business will do better with an online presence, help them set up social media accounts to advertise their products. As you are starting out, be open to doing this for free with hope that these first customers will refer future clients to you. 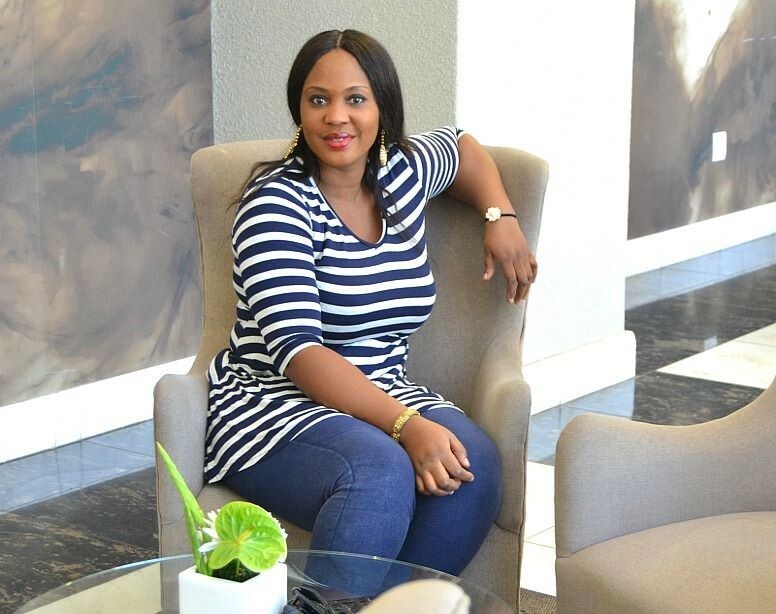 Linda Ikeji, BellaNaija and Sisiyemmie worked hard long years before their passions turned into multi-million naira businesses. If you can’t think of anything to keep busy, follow your mum or dad to work; it doesn’t matter if it is at Main Market or Ariaria. Just get busy. On my Facebook page, I see wonderful posts from my former classmates and I am amazed at what they create (edible dollar note on a cake etc.,) that I share it to my friends. If you are reading this, you probably clicked a link you saw on my Facebook page. It’s my way of advertising my blog. And it has been rewarding in some ways. If you are creating something, share it on social media. It takes just one viral post and you are made. Olajumoke, the bread seller, is a case in point. Besides other endorsements she has, she just go a free five-year lease for a luxury apartment in Lagos. Though her story is more of a case of being at the right place at the right time, it shows how powerful social media can be. 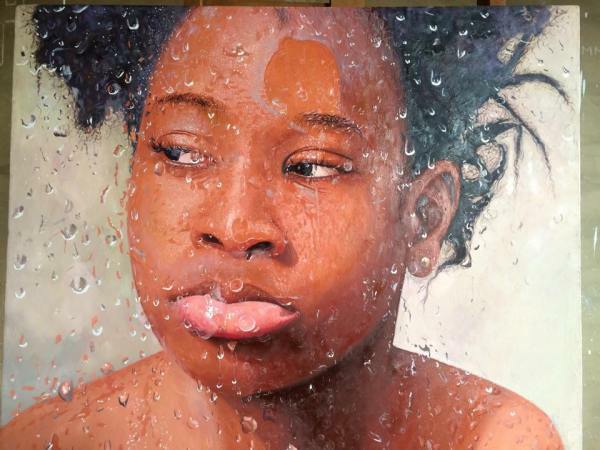 The pictures above are works of two Nigerian artists, Chijioke Anyacho (paints with ink), and Oresegun Olamide (his artworks look real). In the past few months, both of their works went viral through the power of social media. After his work went viral, Olamide was featured on CNN. CNN said “The hyperrealism created in the oil paintings makes his work seem so life like that it is hard to believe they aren’t.” What bigger advertisement does one need? I’m sure he can no longer keep up with demands for his work. “Friends please join me to thank God…..even if you don’t believe in God, just join me and thank Him….I am overwhelmed…I am blown away by what is currently happening to me right now…. THIS IS A MIRACLE. I just can’t explain this……it’s bigger than I ever dreamt. “i can’t believe this” Even as i write this, i am still saying “i can’t believe this”..
Friends this is beyond my widest imaginations…. Magazines from across Africa wants to feature me…. I keep asking myself, what exactly did I do….what is it that I am doing? 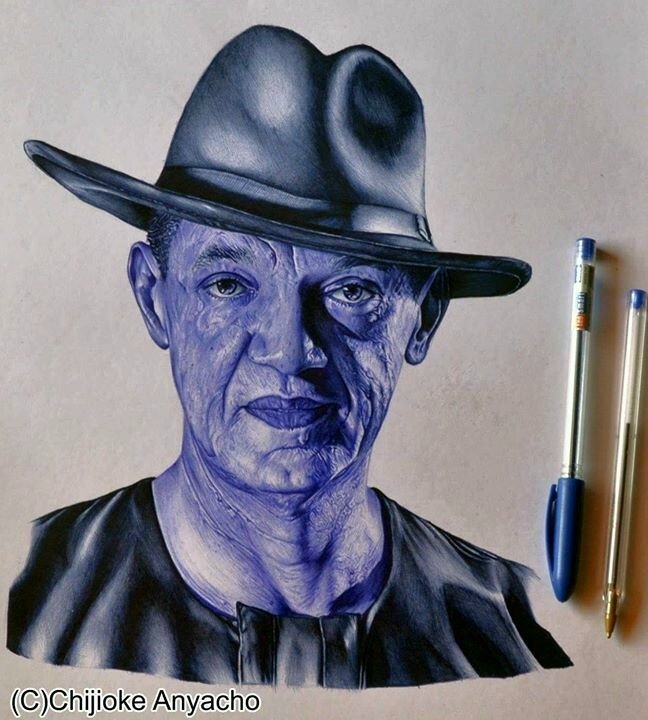 Wetin I do oooooo I no even sabi draw reach some people sef. This is just crazy…..i am lost for words…. Request for my work is even surpassing what I can handle..
Last week I was just a nobody…..last week I was begging someone to have my work for a 60%discount…today my work has appreciated and its 3x the amount I was begging the guy for. And its reviewing itself to meet up. You can only get this once in a life time intense feeling of euphoria if you get busy. And the good thing is once you get your big break, you can maximize the opportunity to further diversify your income. 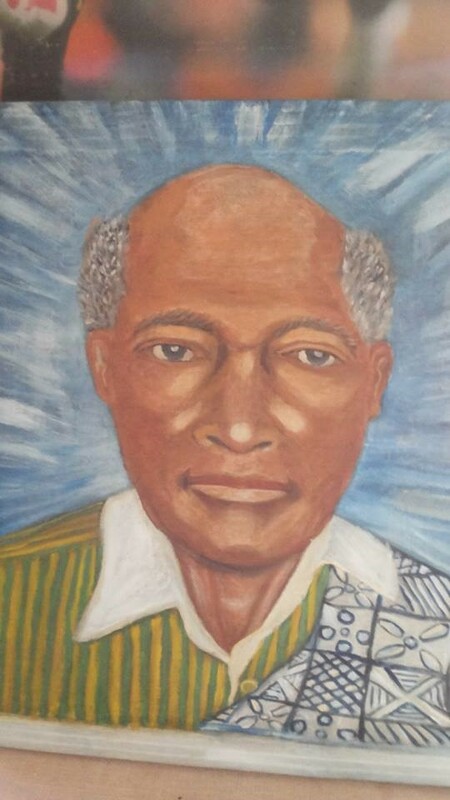 For example, besides selling his artwork at exorbitant prices, Chijioke can get gigs as a motivational speaker, get endorsements from bic, write a book on how social media can help a brand, etc. Don’t envy him. You can do it too, just stop playing candy crush. P.S:* Minor details changed to protect identity of real persons. When I first started getting my feet wet in the legal profession (I still am), I once wrote a brief and my supervisor, after reviewing it, returned it with a note that read: “Good. Well-researched.” He didn’t make any edits. A few weeks later, in the reply brief, the opposing counsel wrote that the argument in the brief was “nonsensical,” was filled with “lack of knowledge,” and was a “gross failing” on my part. I was devastated. About a week after we received the scathing reply, my supervisor walked into my office waving a sheet of paper; the Judge ruled the motion in our favor. The judge found my ‘nonsensical’ argument more convincing than the opposing lawyer’s. As you try to succeed, people will tell you that you are not good enough, sometimes well-meaning. These encounters will affect your self-esteem and make you question your abilities. Don’t be discouraged. Here are three reasons why you should not give up on your goals in the face of criticism. How ever good you are, you can only avoid criticism by locking yourself up in a room, everyday. Once you make the decision to get off your bed and speak to even a family member, expect that from time to time, you will be reminded of areas you fall short. The more people you interact with, the more your ideas and actions will conflict with someone else’s. For e.g., if you are a stay-at-home mum, you have only your husband to please. But if you work, you will get criticisms from the workplace too. It follows that the amount of criticism one gets is directly proportional to his responsibility. Despite his good intentions, President Obama is the most maligned person in the U.S. (bedsides perhaps the Kardashians). In Nigeria, President Buhari is the scape goat. Before him, President Goodluck Jonathan was. So if you aspire to play a significant role in the society, brace yourself for disapproval. Often, when people are criticized, they internalize the negative words such that they weigh heavily on their minds, lingering more than they should. But when put in perspective, criticisms hurt less. If you consider that some criticisms are made in good faith, by those who care about you, to help you grow, then you will take them to heart and work on areas that need improvement. In the same vein, you should disregard criticisms made by detractors to pull you down. Moreover, considering that people’s judgment and values are subjective, you should not care of people’s opinion when you need not. This quote credited to George Clooney sums it up: “You’re never as good as everyone tells you when you win, and you’re never as bad as they say when you lose.” So learn to put both ovation and condemnation in their right place. If people’s judgement are not always reliable, why place undue importance on them? Millions of people heard of Steve Harvey for the first time when he mistakenly announced the wrong winner during the Miss Universe contest. After the mistake, commentators predicted that Harvey’s career was over. But the reverse happened. Miss Universe invited Harvey to host the pageant again next year and his career is flourishing more than ever. I got to know Nigerian musicians Wizkid and Davido only after I read their Babymama drama on Nigerian blogs. While the stories defamed them, and rightfully so, it also made their existence known to me. Next time I hear their songs play, chances are that I will listen in more than I would have if I had never heard about them. More people listening to their songs translates to more money in their bank accounts. People in public relations business say “there is no such thing as bad publicity.” So the next time you get a public reproach, remember that you could be receiving a free advertisement. As far as you continue to relate with people, expect that people will disapprove of certain things you do. If you want to succeed, be open to criticism and humbly improve where necessary. If however you are not keen on succeeding, you now know how to fail–avoid criticism. When I was looking for job fresh out of law school, a lawyer, who would later become my employer, expressed his preference for male employees. He believed that female employees often have other priorities higher than their jobs and are more likely to be absent from work. While family obligations–like having to leave work midday to pick up a sick child from preschool, or taking the day off for doctor appointments–affect the number of hours women work, there are certain other reasons, factors within women’s control, why women don’t make as much progress in their careers as men do. Here are four of them from my personal experience. Some months ago, a former classmate from university, a male, told me he was considering running for a political office in Nigeria in 2019. I was impressed and I asked, “For House of Assembly?” (Lawmaker at the State Level.) He replied, “No, House of Representatives.” (Lawmaker at the federal level) I believe him. In her book Lean In Sheryl Sanberg, Facebook COO, told a story of how when she was in Harvard, she, a female friend, and her brother were all taking one class together. Before the exam, Sheryl and her friend read all the books required for the course which was between seven and ten books. Sheryl’s brother, on the other hand, read only one book and few days to the exam, walked into Sheryl’s room to be tutored. When they finished writing the exam and were discussing how the exam went, Sheryl and her friend pointed out that there were areas they didn’t quite cover well in the exam. When they asked Sheryl’s brother how well he wrote, he told them that he would get the best grade in class. When the results were released, all three had A’s. In retrospect, Sheryl concluded, it wasn’t that her brother was overconfident, it was that she and her female friend were insecure. People advance in their careers by challenging themselves to take on additional responsibilities beyond what their current role requires. However, research shows that most women don’t apply for new opportunities unless they have 100% of the qualifications required for the job. On the other hand, men apply for new jobs when they have only 60% of the qualifications required. In Lean In, Sheryl Sandberg also told a story of how when she was pregnant at a former job and had to take maternity leave, her male subordinates offered to ‘help’ by taking over some of her job responsibilities. By doing so, they positioned themselves for promotion should the position become available. No woman did. Most women in the workplace already put their noses to the grindstone. Women only need to be more aggressive in accepting new challenges as that is the only way to learn and grow. Confidence is vital for leadership. So a woman who is good at her job but lacks confidence will be passed over for promotion while a more confident but less knowledgeable male colleague will be promoted. About eight years ago, a young female friend had two jobs to choose from. One was directly related to what she studied in the university but the organization didn’t have branches in other cities, the other was with a bank that had branches across the country. She chose the bank job because, she reasoned, among other things, that if she got married in the future, she could transfer from the city she lived at the time to join her future husband wherever he might be living. Several years later, she got married, got a transfer and relocated to another city to join her husband. While in my friend’s case, things seem to have worked out well, sometimes, women turn down opportunities when there is no imminent reason to do so. Many young women plan their careers around the expectation that they will get married and have children in future. So while their male colleagues decide, while in university, on which city to settle in and build a career once they graduate, women make little effort to start a career upon graduation but settle for any job they can find in the city where their parents live rationalizing that their future husbands will ultimately decide where they will settle. They reason, “why move to a new city and build a career only to be uprooted upon marriage.” This reasoning robs women between five to ten years of their lives that would have been used to get their feet wet in the workforce. One study shows that only about 7% of women negotiate their salaries whereas 57% of men do. Some female employees actually ask for a cut in their pay to accommodate other employees. Women don’t believe they deserve to earn more because they believe they aren’t worth more. But men think they are ‘awesome’ so they ask for promotions and raises–and they get them. Recently, a female friend told me about how her husband who works in advertising prepared an ‘intimidating’ resume (she said it’s like a booklet) for her to help her in her job search. After her first interview, she felt she wasn’t quite as good as the resume portrays and told her husband to tone down the resume. Now, this friend graduated at the top of her class in university and is one of the most confident and most-likely-to-succeed women I know. Yet her confidence pales in comparison to her husband’s who she told me can nail down any job he wants because he will win any interviewer over with his confidence. If a woman as smart as my friend doesn’t believe in her abilities, how can she ask for a raise? Because women focus more on result rather than pay, even when they are in a good position to ask for a raise, they don’t. Sheryl Sandberg said that when she was negotiating for her job at Facebook, it was her brother-in-law and her husband who encouraged her to ask Mark Zuckerberg, Facebook founder, for more benefits including stocks at Facebook. She did and Mark granted all she requested. But for her husband and brother-in-law, sheryl would have settled for Mark’s initial offer which she thought was good enough. Most women try to dot their i’s and cross their t’s. But leadership positions, with their many responsibilities, sometimes require sacrificing details for efficiency. Men succeed in the workforce more because they see the big picture. Women will succeed more if they learn to do the same. Similarly, if a woman plans to remain in the work force while raising kids, something may have to give. For example, if you are a working mum, you are more likely to put your child in a blue (instead of green) t-shirt on St. Patrick’s day (ask Sheryl Sandberg)–Happy St Patrick’s day by the way–but does it matter? You have other important things to worry about. Another female executive once told a story of how when her career was too demanding, she had her children go to bed at night in their school uniforms so she didn’t have to waste time getting them ready in the mornings. While this may be extreme, I can see how she had to do this to save her career. So if women can learn to let go of things that don’t matter, they can more effectively balance their careers and their work. Women are uniquely gifted because they care about touching lives as well as they do about their careers. Several of my female friends fund non-profits they founded from their meager earnings. Women can accomplish more and make more impact if they make effort to occupy leadership positions. I hope this post inspires you to believe in yourself and assert yourself more. If you do, you are more likely to have an amazing career. P.S. I was inspired to write this post after reading Sheryl Sanberg’s Lean in and watching her TEDtalk speech. Avail yourself of the two resources if you can. I found them very helpful. I have made almost all the mistakes identified in this post. But since reading Sheryl’s book, I try to accept more responsibilities and not turn them down on account of inexperience as I used to. If you like my blog, please comment below, like and share on Facebook. Thank you, as always. So today, I was looking through Youtube (for the umpteenth time, to find yet another tutorial on how to braid her) when I came across Adanna Ohakim’s (daughter of former Imo State Governor) hair tutorial videos. While I’ve been a fan of hers for sometime now (mostly because I’m fascinated that despite her father’s wealth, she has managed to be successful in her own right, getting through medical school and having over 100,000 Youtube subscribers with her husband David for their reality show vlog) I was never quite prepared for what I learned:She braids her own hair. Tiny individual twists. And wait for this–she recycles her artificial hairs (attachment) several times; she doesn’t throw them away after one use like most of us do. Daughter of a former state governor. Now, if you have never lived in Nigeria, you may not understand why I’m impressed by Adanna’s industry and resourcefulness. If you live in a developed country where labor is expensive (I know someone who makes in an hour in U.S. what he made monthly when he was in Nigeria), however rich you are, you probably drive your own car, cook your food, wash your car, change your baby’s diaper, etc. In Nigeria, however, even a middle-class family can afford a chauffeur, a chef, ten domestic servants, etc. So in Nigeria, a girl with Adanna’s background will likely have domestic servants waiting on her. Living in Dublin however, Adanna doesn’t just cook her food, she does her hair– a service even the poor in Nigeria can afford. While in Nigeria you can get a beautiful braid done for between 2000 and 7000 naira (10 to 35 dollars), in Los Angeles, for example, getting your hair done in a salon will set you back 250 dollars, and at least 100 dollars if you get a freelancer to come to your home to do your hair. Freelancers are cheaper because they don’t have overhead costs to worry about. Given the current dollar to naira exchange rate, many Nigerians in diaspora are not willing to spend that much on hair. So taking a cue form their African American counterparts, many Nigerians have learned to do their hair themselves. The alternative would be wearing wigs year-round on a stunted, dandruff-ridden, matted hair ( I know you hate the picture; but don’t judge). I’m not exaggerating. Today, I spoke with a friend in UK who told me she alternates between three wigs–but given how great she is I’m sure she takes good care of her natural hair. Leaving Nigeria changes one’s values and one’s perception of things. In some ways, it changes one’s idea of what really matters. For example, what does it matter whether one’s bag is a channel or run-of-the mill? 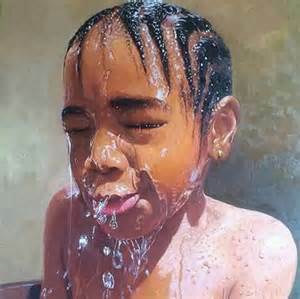 When I was in Nigeria, I had a friend who bought mothercare bathtub which cost about five times more than the ordinary plastic baby bathtubs because she didn’t want her colleagues to think she was cheap when they visit her new baby. I have another friend, an amazing one, whom I tease that she wouldn’t buy a running shoe without a ‘good mark'(the swoosh) because she only buys Nike. When you leave Nigeria shores, nobody cares about how you are dressed (except you are a Kim Kardashian) and when you realize nobody is assessing or judging you in that way, you make decisions based on what works for you and not on what other people might think. For example, Adanna’s, Ohakim’s daughter, mum and her sister bought her new baby Ralph Lauren and Gucci clothes but she told them not to ‘spoil’ the baby with designer clothes because she won’t be buying them; she would rather invest them for the future, she said. She can follow through with this decision because she is in Dublin. Were she in Nigeria, the pressure to ‘represent’ when her father’s minister and governor friends visit will make it harder for her to put her family’s long-term financial goals over designer baby clothes. I imagine that in Nigeria, if someone wants to do her hair herself, friends will judge her for being cheap. But here, braiding one’s hair is the norm. Most of my Nigerian female friends have learned how to do their hair. One, a doctor whose mum was a public office holder in the past administration was wearing tiny braids she did her self when I visited her about two weeks ago. Another, an RN who makes six-figure salary braids her hair and her daughter’s. 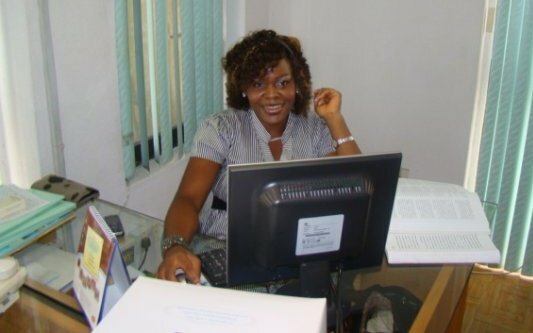 A colleague, who shortly before she left Nigeria to join her husband in U.S. worked as an apprentice in a salon where she was teased about how a ‘whole’ lawyer can be learning how to braid hair, doesn’t spend money on hair as she and another friend of hers take turns to do each other’s hair. 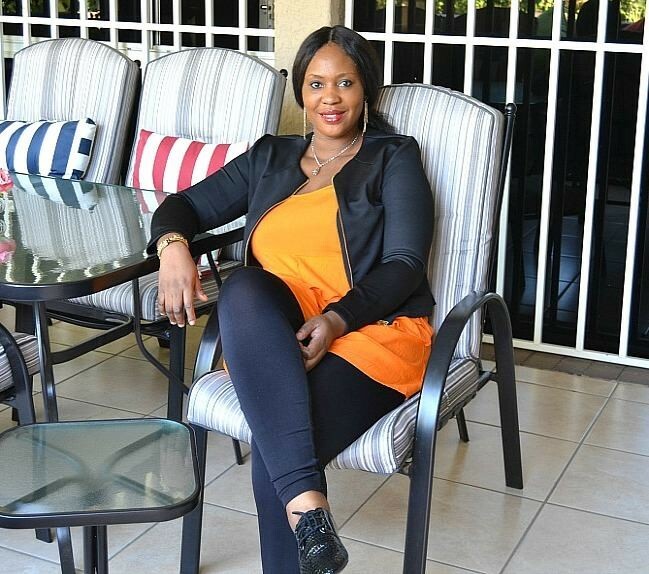 Yet another friend of mine, also a lawyer, fixes her own weaves. Watching these young women do their hair has thought me that we can do anything we set our minds to. Years ago, I would never have imagined that it is remotely possible for someone to braid their entire hair–a task that takes even professionals as many as ten hours. I would have wondered how one can reach the back of one’s hair to braid. But I have seen many girls do it on Youtube and my girlfriends have shown me it is possible. Adversity indeed forces one to be resourceful. Just as I have realized one can indeed braid one’s hair, something I considered impossible before, you will realize success is attainable if you surround yourself with positive people. But if you continue to hang out with people who after realizing their cheese have been moved only mourn its lost without looking for it, your cheese will be permanently lost. In particular, as Nigeria’s economy continues to worsen, one can surround oneself with friends who will curse the present administration but do nothing to help themselves. In the alternative, one can surround oneself with people who know that now, more than ever, is the best time to make good money in Nigeria, either by producing things that are no longer imported or finding some other opportunity presented by the depreciation of the naira. (An acquaintance, a young man who is barely thirty, bought a car just from the money he made by moving money back and forth between Nigeria and another country with a hard currency in the wake of the economic crisis). Thanks to my hair-braiding friends who inspired me to write this post but who for privacy reasons I cannot openly acknowledge. Now, let me watch more hair videos with hope that very soon I will join the hairdressers club. P.S: If you are in Nigeria, do you know anyone in Nigeria who braids her own hair? I’d love to know. Please click the follow button to get updates when I post new entries and click the Facebook icon to share on your wall. I appreciate you guys!. On a day last week, Jumoke woke up a bread-seller. Little did she know that later that day, with a click of a camera, her life would change forever. 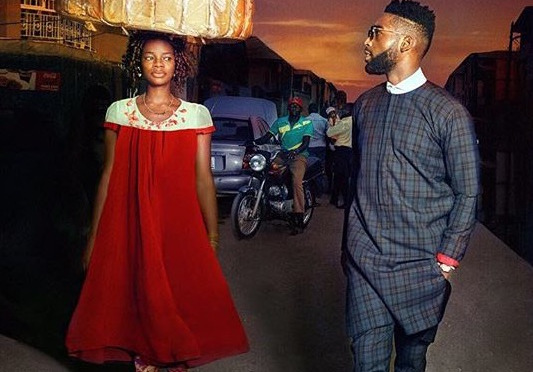 Photographer and Singer TY Bello was having a photo shoot session with Nigerian-UK rapper, Tinie Tempah for ThisDay Style Magazine when Jumoke Orisaguna happened to be passing by (the first picture above). When TY Bello shared the photo on her social media page, people started asking who the lady was and if she was a model. Moved by reactions to the photo TY Bello commenced a search for the Agege bread seller. She later found her (I read somewhere that Jumoke learned that she’d gone viral when someone showed her the picture on internet and told her everyone was talking about her) and announced on her Instagram page that she was going to help her kick-start a modelling career. 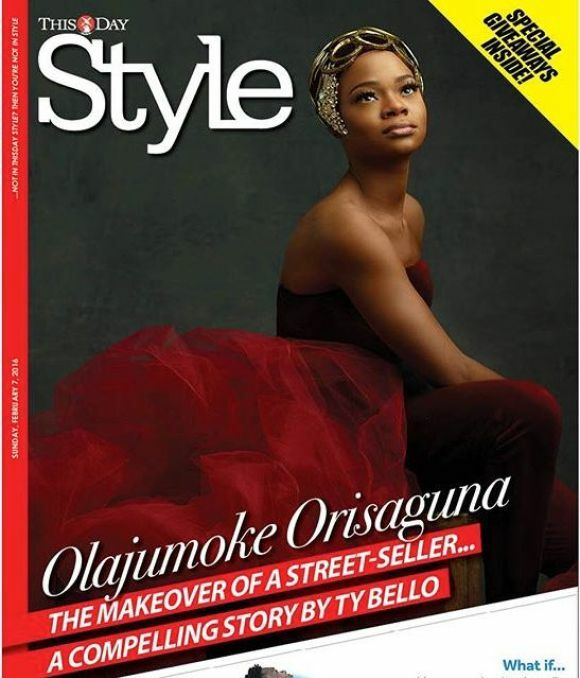 Today, the 27-years old mother of two, is on the cover of ThisDay Style Magazine (Second Picture). Jumoke’s story is a lesson in the importance of showing up. If Jumoke, being unemployed, stayed at home pinging away rather than starting something, however small, like she did, she wouldn’t have walked into Ty Bello’s picture and her life definitely wouldn’t have changed. I have had people tell me how they applied for jobs they obviously didn’t qualify for but which they got, sometimes earning four times what they earned at their previous jobs. In some cases, even after being employed, they didn’t know how to go about the job responsibilities attached to the new job but they faked it till they made it. If they didn’t apply for the jobs, they wouldn’t have been considered for the positions. This reinforces the Igbo adage that says onye mmiri huru ukwu ya ka o na-ama , only a person whose legs are outside gets beaten by the rain. So however seemingly unimportant your day job, side hustle, even volunteer gig is, keep doing it. You don’t want your TY Bello to show up only to learn that you have quit. Chance favors the prepared so live as if you are awaiting a bigger role you are destined to play in life. We wish Jumoke more success in life as her story continues to inspire us. Have you ever landed an opportunity merely because you were at the right place at the right time? Do share in the comments section.